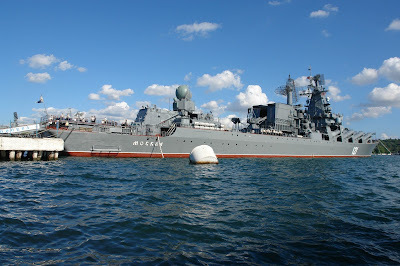 A picture taken on September 10, 2008, shows the Moskva, missile cruiser flagship of Russian Black Sea Fleet, entering Sevastopol bay. 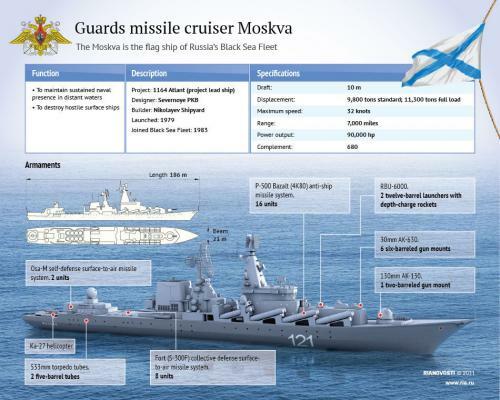 MOSCOW, Sept 4 (Reuters) - Russia is sending a missile cruiser to the east Mediterranean to take over the navy's operations in the region, state agency Interfax quoted a military source as saying on Wednesday, as the United States prepares for a possible military strike in Syria. President Barack Obama has won backing from key figures in the U.S. Congress in his call for limited U.S. strikes on Syria to punish President Bashar al-Assad for his suspected use of chemical weapons against civilians. The ship, Moskva, will take over operations from a naval unit in the region that Moscow says is needed to protect national interests. It will be joined by a destroyer from Russia's Baltic Fleet and a frigate from the Black Sea Fleet. "The Cruiser Moskva is heading to the Gibraltar Straits. In approximately 10 days it will enter the east Mediterranean, where it will take over as the flagship of the naval task force," the source said. Moscow has been Assad's most powerful ally, protecting him from consecutive U.N. security resolutions aimed at pressuring him to end violence. Russia insists the conflict must be solved through political dialogue in which Assad must take part. Russia is sending a missile cruiser to the east Mediterranean to take over the navy's operations in the region, state agency Interfax quoted a military source as saying on Wednesday, as the United States prepares for a possible military strike in Syria. Nonetheless, President Vladimir Putin, in an interview released on Wednesday, did not rule out approving a military operation if clear evidence showed Damascus had carried out the attacks, but said any attack would be illegal without U.N. support.